Please e-mail Skip Novak for more information or to make a booking. Note: Because this is a true mountain wilderness, we are only accepting expert skiers and climbers for ski mountaineering and/or the Shackleton Traverse who are fully capable of safe operations (with respect to crevasse and avalanche risk) including the ability to self rescue. In the event of a group of competent amateurs applying as a team, we would be happy to organize a guiding service, the cost of which would be borne by the client group. 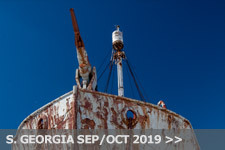 Also be aware that for any camping ashore, the South Georgia Government requires the group to apply for an Expedition Permit, the cost of which is currently 1000 GBP. 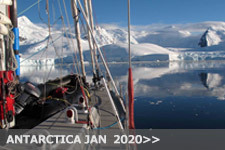 This cost must also be borne by the expedition group. 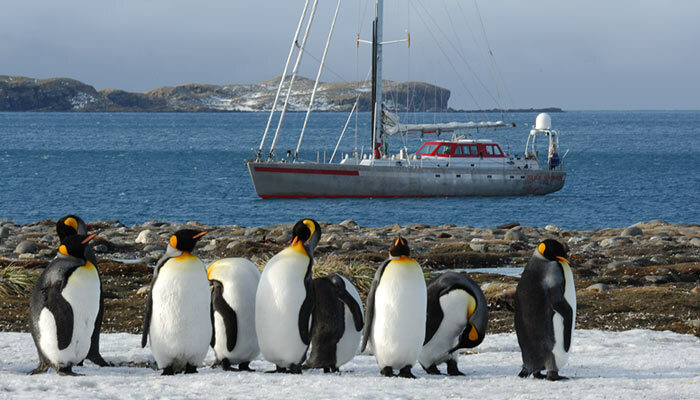 This cruise will begin and end in Stanley in the Falklands Islands. 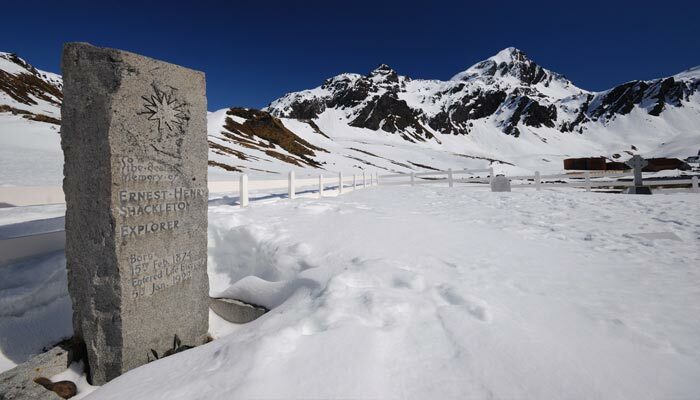 The Falkland Islands (direct your travel agent to Mount Pleasant Airport) is reached via Santiago and Punta Arenas on a once per week basis every Saturday with Lan Chile. Therefore these cruises can only be in multiples of seven days. There is also a flight more or less once weekly from Brize Norton in the UK on the RAF flight, now operated by a sub contracting airline. This is an expensive, but time saving alternative. However, the flights can be cancelled or delayed without notice due to military priority. Guests would board the vessel immediately on arrival and (weather permitting) the next day we would sail for South Georgia. Considering the traverse time there and back, 18 days are envisaged on the island for shore landings. It is the intention to be back in Stanley no later than the night before the Saturday flight out on Day 28 of the schedule. 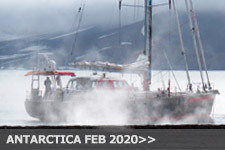 We suggest that if you are arriving via Chile that you plan to be in Santiago on the Thursday night prior to the early Saturday morning departure from Santiago to Mount Pleasant Airport in the Falklands. This will allow some slack for missed connections and bags that did not make connections. Note that there is only one flight per week going into the Falklands, so this is critical. We also suggest you stay at the Airport Holiday Inn while in Santiago as it is a walk across the street to the terminal. And, you can enjoy this fascinating city on the Friday and meet up with your team mates. All inclusive of food and drink once on board. A maximum of eight guests is envisaged. 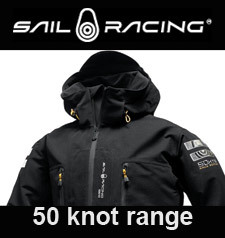 This cost includes the use of Sail Racing foul weather gear, all personal safety equipment for sailing (lifejacket, harness) and the use of the Inmarsat communications equipment (note: satime is billed separately as used) and the 200 GBP passenger landing fee. 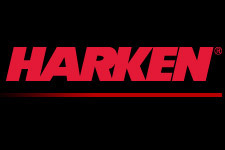 Full details, obligations on both sides and payment terms are included in the Charter Agreement. NOTE: Due to the fragile nature of the fauna and flora on the island and the fact that tourist impact for some areas is under study and analysis, we cannot guarantee that all wildlife sites can be visited, as government reserves the right to close off any area deemed to be under threat at short notice. 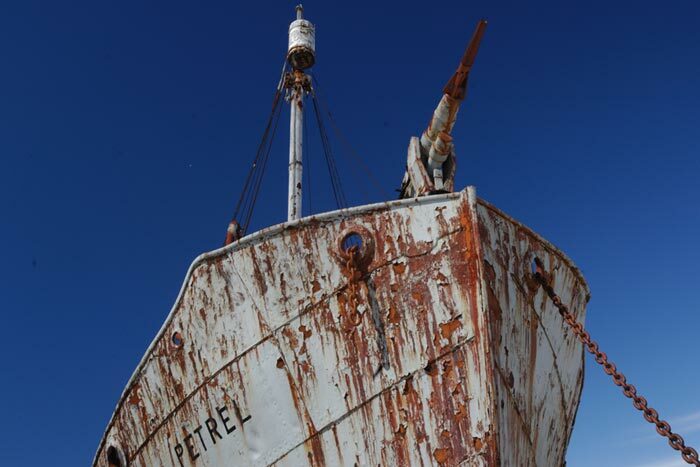 Pelagic Australis is run as a 'dry ship' when at sea and possibly at some anchorages when there is a real possibility of having to 'up anchor' and move off. This is at the Skippers discretion. 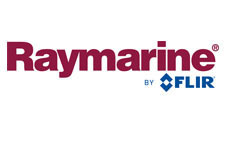 In port reasonable amounts of alcohol can be consumed but excessive alcohol consumption that leads to situations putting people at risk, or where the harmony of life on board is disturbed to an extent that other guests are made uncomfortable will not be tolerated. If this situation arises, the Skipper reserves the right to return to port and to disembark any Charterer at an intermediary port, or disembark the entire group in a group charter if necessary. 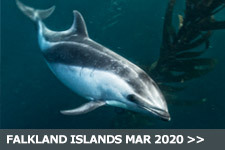 The charter guests arrive at Mount Pleasant Airport and take a 40 minute bus ride to Stanley to meet Pelagic Australis. They move on board immediately. The afternoon is spent stowing personal gear, familiarizing the team with the vessel and having ‘live a board’ and safety briefings. 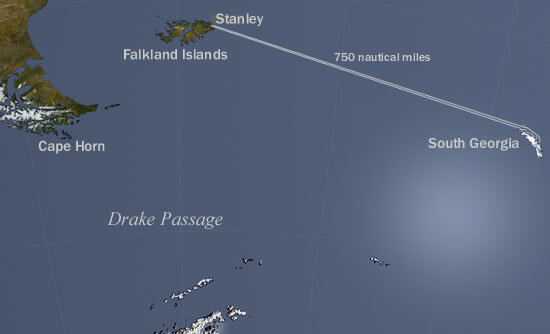 Weather permitting, the vessel would leave Stanley bound for the northwest corner of the island 750 miles away. In most cases this would be a fast downwind passage in the prevailing westerly winds. Passage time would be roughly three to three and a half days. Landfall will be on the Willis Islands and we would continue with a passage through Bird Sound between Bird Island and mainland and anchor at Elsehul Bay. Here we would have a thorough briefing of the guidelines to follow with respect to the wildlife and take our first walk ashore. 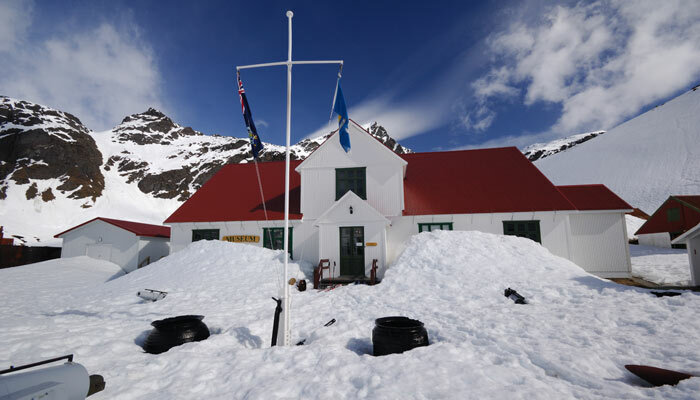 Weather permitting we would devote 2 days of possible waiting time at Elsehul in order to back track around the northwest corner of the island and enter King Haakon Bay where Shackleton and his men ran ashore. If conditions were calm, a night would be spent near Peggoty Bluff where his trek across the island began. Start point for Shackleton traverse Peggotty Bluff. Leaving King Haakon we would sail back to the northeast coast through Bird Sound and make for Rosita Harbour in the Bay of Isles. 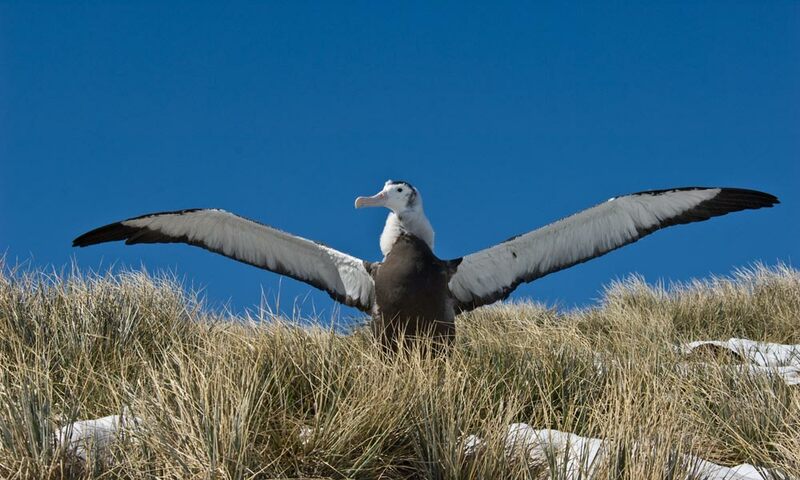 Weather permitting, we would land on Prion Island, which has one of the highest concentrations of nesting Great Wandering Albatross in the world. Our visit would be limited to a half day (the maximum allowed per visit by the government’s management plan for this sensitive area). 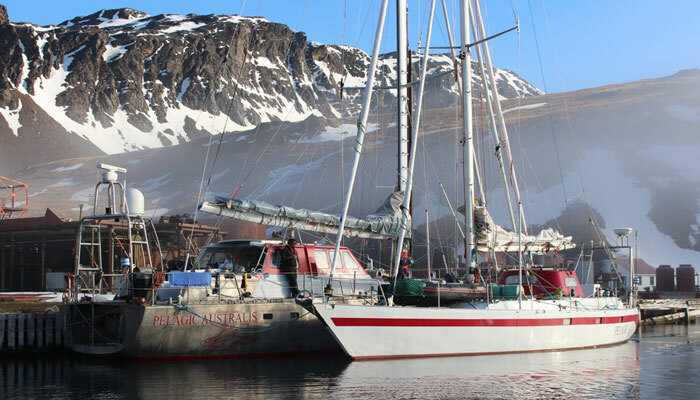 We would then sail overnight to King Edward Point which is the administrative base for the island. 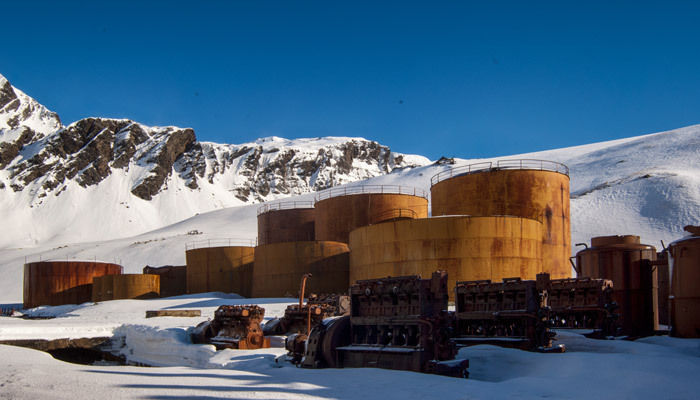 Two days would be spent in King Edward Point which is a short walk from Grytviken, the premier shore based whaling facility on South Georgia which was abandoned in the 60’s. 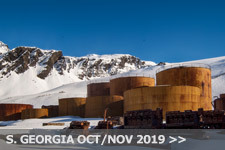 Visiting the whaling station which has now been incorporated into the South Georgia Museum is a full day. Long walks behind the station including a possible overland trek to Maiviken Bay are possibilities. 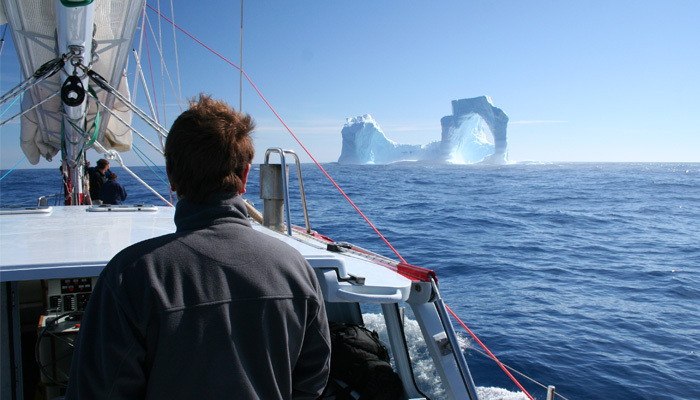 Sailing to the snout of the Nordenskjold Glacier in Cumberland Bay East is a must. Continually discharging ice into the bay, this is the largest of the glaciers on South Georgia. Later, an afternoon run down the coast brings us to Cobblers Cove, a natural harbour with a dramatic entrance. Gentoo Penguins are nesting on the slopes above the cove, while Macaroni Penguins can be found up over a pass back to the north (an hour walk). We would spend the night at Cobblers Cove. This is a good storm anchorage, so it would be used as a fall back in case of heavy weather while further down the coast. Weather and surf conditions permitting, we would attempt the beach landing at St Andrews Bay a few hours steaming from Cobblers Cove. Behind the beach is the largest colony of King Penguins on the Island. In order reach the main part of the colony we would have to trek to the snout of a glacier in order to cross the river flowing from it down to the sea. It is a spectacular wildlife venue on a fine day. Further south along the coast lies Gold Harbour which is one of the most scenic anchorages on the island. Again the landing is on an open shoreline and weather dependent and if successful we would spend the day on the beaches. Near the southern tip of the island Cooper Bay affords a rich variety of wildlife, including Fur Seals (in less concentrations and thereby the colonies more easily accessed) and many harems of Elephant Seals with the competing bulls (October cruise only). Two days in the area are required to fully explore the bay. If need be, the nights would be spent nearby in a safer anchorage at Larsen Harbour, a dramatic fjord with a glacier at its head. 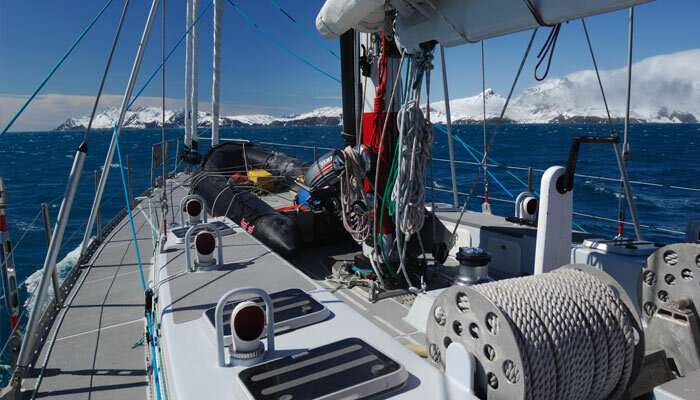 Most likely lost due to adverse weather, so we would in effect be spending more time in either Cobblers Cove, Larsen Harbour, Rosita Harbour or King Edward Point, all with access to the shore in bad weather. About this time we would need to be on standby for the return to Stanley. 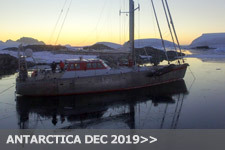 By Day 22, if there was a favourable weather window (considering the return is against the prevailing wind) we would be obliged to take the opportunity, in order to make sure that we arrive on time for the guests to make the plane on the Saturday, with at least a day to spare. Passage back to Stanley, arriving no later than the night of DAY 28. Flight from Mount Pleasant Airport back to Punta Arenas with a direct connection to Santiago. The following slide shows open in pop ups and you will need flash player installed to view them. Click image to view a slide show of the Shackleton traverse in Nov 2006 showing ski randonne across S. georgia terrain Click image to view a slide show of the wildlife expedition in Oct 2007. 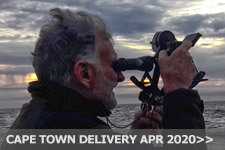 Please e-mail skipnovak@pelagic.co.uk for more information or to make a booking.